Coming from UVViewSoft -- a developer that has already given us Universal Viewer, SynWrite, and LogViewer -- CudaText (http://www.uvviewsoft.com/cudatext/) is a multi-platform programmer oriented text editor available for MacOS, Linux and Windows. 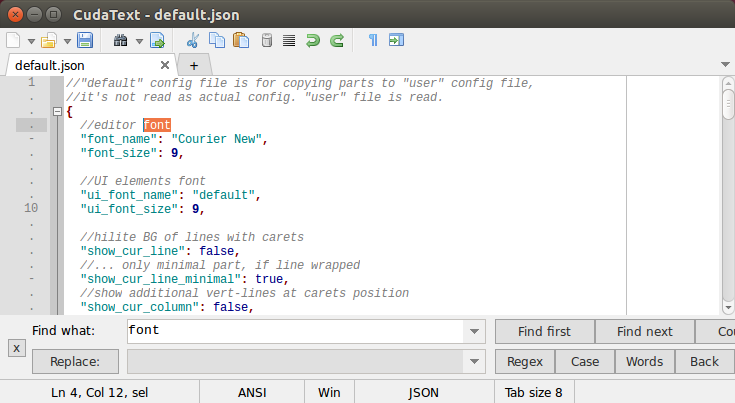 [url]http://www.uvviewsoft.com/cudatext/[/url] author wrote: CudaText is a cross-platform text editor, written in Lazarus. CudaText latest 32-bit (untested!) portableWindows release is v1.2.14 (changelog at http://www.uvviewsoft.com/cudatext/history.txt) that can be downloaded from http://www.uvviewsoft.com/cudatext/download.html. Last edited by Midas on Thu May 11, 2017 3:36 am, edited 3 times in total. can be downloaded from http://www.uvviewsoft.com/cudatext/download.html. The download link points to a Sourceforge page but the Website is down atm. Third-party review of CudaText at http://betanews.com/2016/02/27/cudatext ... e-can-use/. Thanks for posting. It's always useful to read independent evaluations of this type. The comments for the article are the most interesting and telling part. Yes it is my editor. No space in name, CudaText, no space. or as many languages for coding. with syntax highlighting. It's horror and Synwrite is ok here- it has lexers in zip, and i don't need to copy-paste it. So compare with NPP is bad here.. Since version 1.6.1.1 (as of 2016.01.10 the latest version is 1.6.2.0) CudaText comes in separate x32 and x64 versions. Please rename topic to "CudaText" w/o space in it. Alextp wrote: Please rename topic to "CudaText" w/o space in it. + command "place bookmarks on carets"
+ replace-all: show elapsed time in sec.